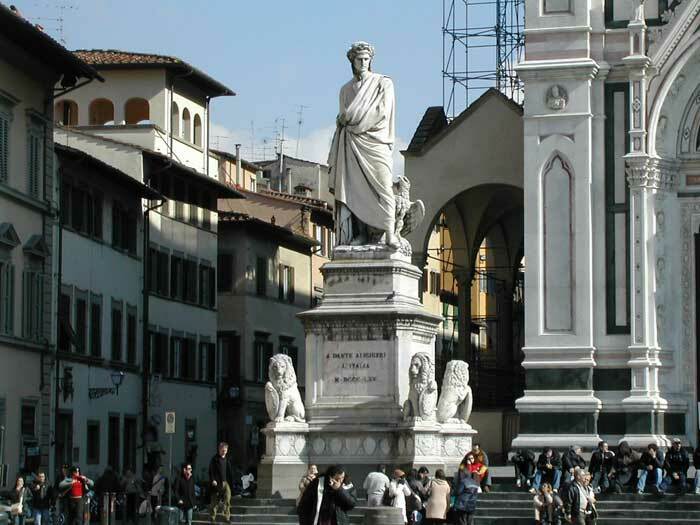 Today, I walked through the Piazza di Santa Croce and saw people all over as if it were already Spring. Last week, with the snow, there was only one group of Japanese tourists huddled together walking briskly through the piazza. This week, there are people all over: kids on school trips, many different tour groups, and other people sitting on the steps in front of the church. It felt great to be outside in the sun where today's temperature is about 14°C (about 57°F). I almost wanted to stay outside and not come back home. I pulled my camera out of my pocket and quickly took a snapshot of Dante standing guard at the entrance of the church. Every time I walk by, I look back at him. I wonder what he'd think of all these people who come to Florence to live or to visit. Everybody walks past him, some visit his section of the Santa Croce church where he is now buried, and others take pictures of the church and piazza as mementos of their trip. The sun has come out and with it many tourists and locals. As I put my camera back in my pocket, I looked out at the people sitting everywhere in the piazza: some on the steps in front of the church, a few on the few cement benches on the outskirts of the piazza, and still others right dab in the middle of the piazza on the cobblestone. Everyone seemed to be busy. Some people were taking photos or reading tour books as they stood in the piazza while others were either eating a panino or talking on their cell phones. Not many noticed that Dante was looking over them all.